Hey guys, it’s Ping here. Today I wanted to share with you a valuable lesson I learned on my most recent first date. My lady friend wanted to cook my favorite meal (squid), so on my way to her house, I popped into my local wine shop. The shopkeeper asked me if I needed help selecting a wine, but I played it cool even though I know nothing about wine. Where I’m from, we don’t really have wine, just lots and lots of squid. I wandered the bottle-filled aisles, finally selecting the one with the most colorful and eye-catching label and a cheaper price tag. I know you’re thinking—I’m a cheapskate, but wine is wine. No need to shell out extra cash when it’s all the same at the end of the day, right? The wine and our date were both equally horrible. The wine tasted like it had been aging in a hot garage for a few years. My date was not impressed. The Quality of Your Gifts Reflects the Quality of Your Brand. What I had forgotten was one of the key ideas we hold dear here at The Icebox; that every gift you give is an expression of your brand. I missed out on a golden opportunity to show my dashing and chivalrous qualities by choosing a wine that wasn’t up to par with how simply amazing I am. What we all need is a guide, and here at The Icebox our Creative Solutions Experts are here to help you choose the best gifts for your clients. Our experts have a knowledge and passion for promotional swag and branded apparel, and they will guide you through when to save, when to splurge, and how to choose an item that is going to make a memorable impression with your clients and prospects. If you can dream it, chances are our Creative Experts can find it for you. Icebox branding experts have access to product and supplier resources that are not available to the general consumer. They know the vendors personally and have seen and touched the products to evaluate their quality. Take bags and totes, for instance. Of course, anyone can find a bag online (and spend hours of looking). Using a true Creative Expert and personal swag concierge will allow you to focus on your job while your “swag concierge” presents you with a variety of bag options, ensuring that your choice will be recipient’s favorite bag that is used every day. 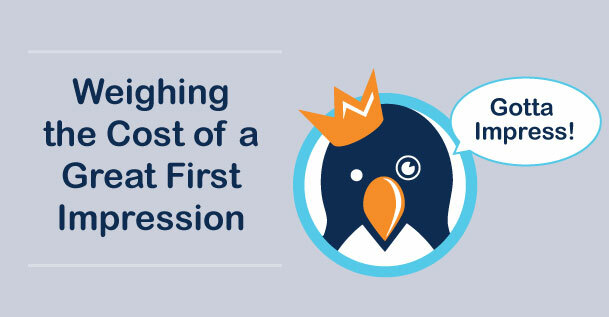 Take it from a penguin who knows, there’s only one chance to make a great first impression. I’m personally calling up my dedicated Creative Expert today to help me find something special for my next first date this weekend. Wish me luck!